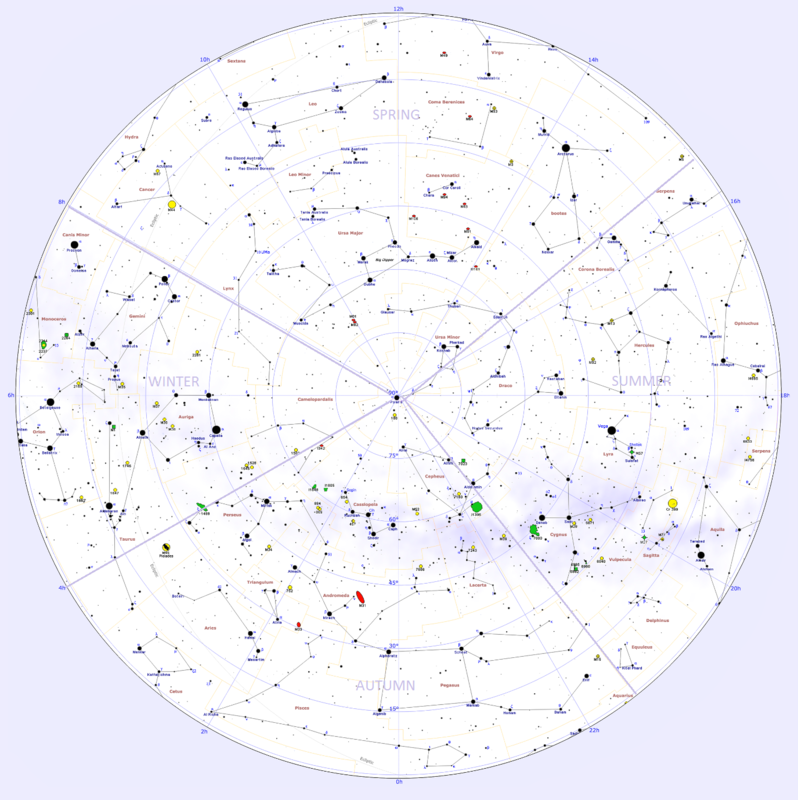 Constellations that can be seen in the evening sky change from month to month. Stars rise and set four minutes earlier each night and, as a result, we see constellations rising and setting two hours earlier each month. They move by 90 degrees from one season to the next and return to the same position after a full year. Each constellation is best seen in the evening sky at a certain time of year, whether it only briefly shows up above the horizon or it is visible throughout the year from a certain location. Below is the list of constellations visible at 9 pm each month. These are not all the constellations that can be seen in the evening sky at any particular time, but simply those that are best observed at the given time of year. Even though each given month is the best time to observe a particular constellation in the evening, the constellation may not be visible from every location on Earth. The northern constellations Cassiopeia and Ursa Major, for instance, are easy to see for observers in the northern hemisphere, but invisible to those living south of latitudes 20°S and 30°S respectively. Similarly, the southern constellations Apus, Chamaeleon, Mensa and Octans are not visible north of equatorial latitudes, while the more prominent Carina, Centaurus and Crux cannot be seen by observers north of latitudes 20°N, 25°N and 20°N respectively. The table below shows the latitudes between which each constellation is visible.